Update: Microsoft has updated the support page and made a correction to the date. It now mentions 2018, rather than 2019. Original story follows below. Windows 10 Mobile hasn’t officially rolled out to consumer devices yet, but we’re already seeing some documentation about the end-of-life treatment for the latest mobile operating system from Microsoft. 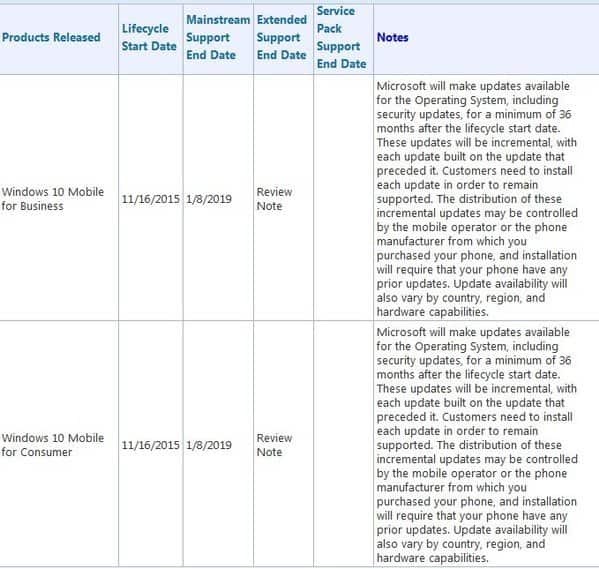 Courtesy of Nokia Poweruser via Twitter, we’ve gotten to read through a leaked official document that details how long and what type of support Windows 10 Mobile as an operating system will receive during its lifetime. As for the ultimate decision-maker on whether an update is rolled out and offered to end-users, Microsoft’s document notes that the incremental updates will be left to the discretion of the carrier or service provider or the device hardware manufacturer. Obviously there’s the ‘will vary by location and hardware ability’ bit tacked on at the end, but the whole of the document gives Windows 10 Mobile users come clarity regarding their current, as well as future, device’s update path. Update: It looks like the documents are less of a leak and more of an official release from Microsoft. For more on the lifecycle of Windows 10 Mobile or other Microsoft services, please visit the company’s Support Lifecycle page. Will this new approach to Windows 10 Mobile allow the OS to flourish as Microsoft plans?